Are we as a community eating better? Are more of us working towards healthier lives? Is there a growing movement away from fast food and towards food that is cooked using simple, nutritious ingredients. What does the research show? The CSIRO (Commonwealth Scientific and Industrial Research Organisation) tells us that Australians eat far too much junk food. When a lot of people eat a lot of junk food, eating a lot of junk food becomes the norm and not eating a lot of it the exception. A critical mass of people making bad food choices influence others to make those choices too. When you are surrounded by individuals, communities and organisations that keep offering unhealthy food options, and junk food becomes far more accessible than healthy food then it gets harder and harder for individuals to hold on to their vision of a healthy diet. What does healthy food look like? Is it a sugar filled muesli bar? Is it a meal at Subway? Is it a nori roll snack or sushi? When you are surrounded by people who eat healthy food; food made with the use of whole primary ingredients: brown rice, lentils, chick peas, fresh meats, vegetables and fruits, barley, beans, etc it is harder and harder to eat junk food. In a community of independent thinkers and educators eating well, using whole primary ingredients to create delicious meals becomes easier and easier. A critical mass of health food eaters leads to more health food eaters, as each healthy meal interaction inspires another healthy meal creation. Schools are a revelation. Very few schools provide truly good health lunch options and most workplaces have no kitchens or proper dining areas. Our culture denigrates the importance of the lunch hour, the dinner hour. Eating is squeezed in between really important meetings and other really important commitments. Michale Pollan, in his documentary series Cooked, chronicles the demise of home cooked meals. Processed, instant foods developed for the military needed a new target audience once the war was over. Advertising campaigns were quick to take advantage of the woman’s liberation movements. Instead of encouraging men to share the work involved in preparing healthy meals, the advertising world went all out to denigrate the work involved in cooking. The answer to eating healthy meals was not in sharing the responsibility of its preparation with family members, the answer was in a tin can. 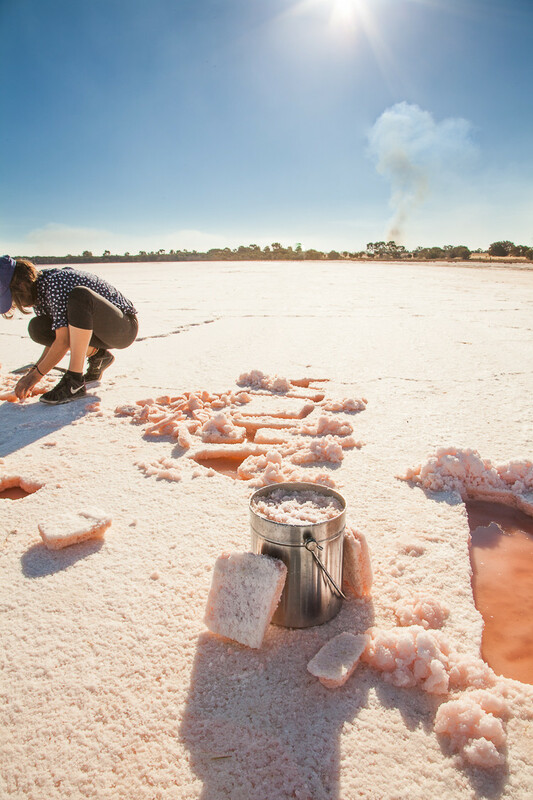 This post is dedicated to Matt and Lentil, from Grown and Gathered, who inspired me to take my family to the pink lakes near Dimboola, to harvest salt. Their book ‘ Grown and Gathered’ presents a strong case for the immense beauty that is found in a healthy food culture. When as a community we allowed the fast food industry to tell us that cooking at home was a meaningless task and a waste of time, we gave them permission to strip our culture bare. What after all is culture, if not the food that we eat and the way we prepare it? The songs we sing as we come together, the rituals we create in its preparation, the activities we engage in and the relationships we build as we search for simple ingredients and forage for wild foods? When we go to Japan or Italy or Spain is food not one of the most important cultural experiences we look for? Do we go to Spain to eat MacDonald’s in Spain? Is Spanish food culture defined by the Fast Food Industry? Is Italian food culture defined by the fast food industry? The very worst thing about fast food is not its lack of nutrition, nor its high levels of sugar, salt and fat, but its power to strip us naked of the rituals and skills, the knowledge and resourcefulness that are essential ingredients in the preparation of truly healthy food. Pink Lake near Dimboola, Victoria, Australia. Ralf always knows what to do. 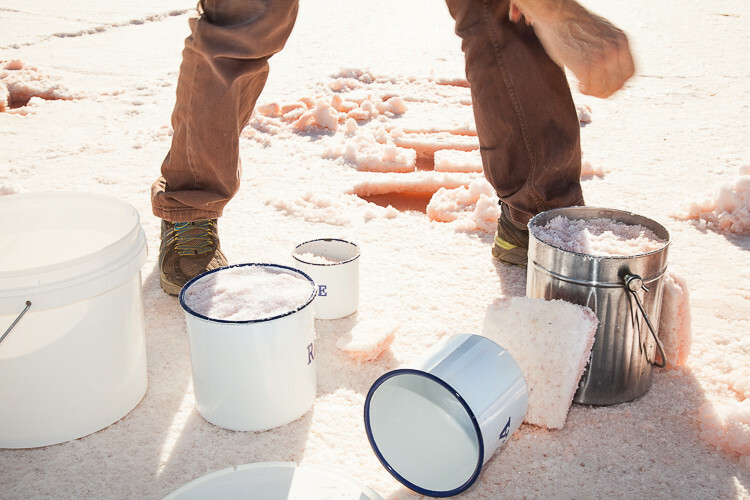 He has never harvested salt before, and yet he was quick to find a way for us to harvest. Here he is cutting square holes into the dried salt, using the edge of a hand held shovel. The very first wedge of salt is harvested. I feel so priviledged to be able to share these meaningful experiences with my daughters. The lake water has not completely dried out and can be found just underneath the surface. Artemisia our five year old is enjoying the feeling of salt and water. Ahlia is writing her name in the salt. We want to harvest enougth salt for the year. Back at home the wet salt is dried in trays in our living room. Zucchini fritters with sesame seeds, breadcrumbs and pink lake salt. I hadn’t heard that “Processed, instant foods developed for the military needed a new target audience once the war was over. Advertising campaigns were quick to take advantage of the woman’s liberation movements.” It doesn’t surprise me, but very much saddens me that we as human beings have the capacity to be more concerned with profit than people. It was an interesting revelation to me too. The Cooked series by Michael Pollan is really good and worth watching if you are up for a bit of documentary film. And Ruth I have just discovered your blog, and what a huge journey you are having with your partner. My care and best wishes to you both. And is the most recent post from this year? I could not quite decipher the dates of the posts. Thanks for your blog on the salt. 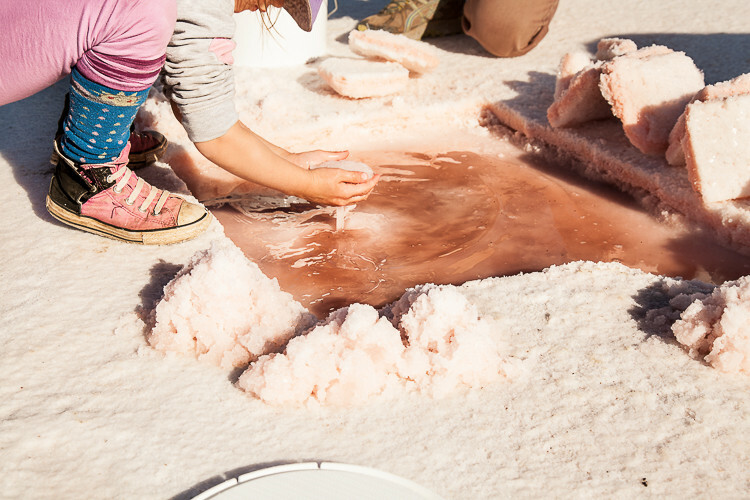 We have just come back from a trip to Little Desert national park and we visited the pink salt lake. The lake had lots of water in it and was so pink! we harvested some, and it is very wet, so will now dry it out. We also harvested some olives along the road into the national park where some olives had gone wild from the olive orchards there. So perfect we will use the pink salt to brine our olives! thanks for your inspiration! circular inspirations, I was inspired to go due to the very beautiful book produced by Matt and Lentil. Ive just read this part of matt and lentils book, so will be doing some heavy reading over the coming days! Hi Ben! I did some research on this and spoke with the Parks Vic guys. They said that if you are just harvesting a small amount for home use, nobody makes a fuss. It is only if harvesting at commercial quantities that you would need to get a license. We took lots of containers with us with lids and harvested enough for a year. I plan to go back this March to collect more. It was a great family trip and we stopped at the Grampians on the way home for a swim in the river which made for a really beautiful time. Thanks Mara, im heading to adelaide over NYE. I wonder if thats a suitable time to harvest on the way home? Also was there anyone else around – did they give strange looks? Hello again, by the way are you the Social Food project Ben? And January might be ok..it really depends on what rain there has been in that area. We went in late May, I think…March, April is the best time, but I think the road to Adelaide takes you right past the site, so you can’t go wrong. The only thing that will stop you is if the lake is still wet and hence collecting salt in a wet lake is harder and of course much wetter. You will need to dry the salt when you get back home, as it is likely to be damp (unless you have managed to harvest on a day where there has been a big week of dry hot weather). And we received no strange looks at all. But if you do, don’t worry at all. You are not doing something bad. If you are unlucky and you get someone that is a bit obnoxious and says you should not, just thank them for the information and let them know that the Parks Vic guys are not worried about it. Also the salt has a strong odour too it. And the odour remains, especially if it is not dried out really well. It has not worried me nor my family. I have used it for everything. Salt is antimicrobial so my understanding is that it is safe. We have used it since June last year, for fermenting, and all cooking projects, cakes etc. All the very best with it and happy travels.